Rippedsheets.com offers ID labels that can be custom printed and diecut to any shape or size. They can also be coated with an anti-microbial coating for protection against bacteria. 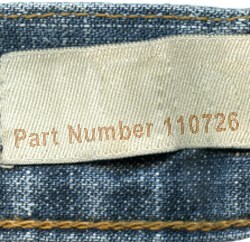 Rippedsheets.com offers a number of different materials for ID labels, tags, and wristbands. These labels can be die-cut to any shape or size and can be custom printed. Meeting AATCC IVA wash test requirements, 110726, Washable Fabric Label is die-cut on sheets with no rough edges. They just need to be popped out of the sheet after printing. It is a white polyester-woven fabric that can be printed from the bypass tray of a small desktop laser printer. It is tear-resistant, even from sewing, and can be used on clothing, tents, or other fabric items that require identification tags. Passed UL Certification for Child Safety Under 12 Years. The 102190 Washable Fabric Self Adhesive Label is a unique material that is very sticky and is manufactured only by Rippedsheets.com. It is the only laser printable label on the market that sticks to carpets and fabrics. It is washable if applied to an existing sewn-on tag only. It doubles its stickiness on the carpet and fabric after 10 days and doubles again after 30 days. The Facestock is 2 mils thick and the adhesive is 1.8 mils thick. This material is compliant with the CONEG Model Toxics Packing Legislation. It also passed UL Certification for Child Safety Under 12 Years. Dry Clean Reemay fabric. 110721, has meet the mill spec standards. This white laser printable fabric is printable from the bypass tray of color and B/W laser printers or copiers only in the Paper mode. It is printable one side only. This is a nonwoven Reemay with a polymer coating that resists tearing from sewing and use. The 102270 Satin Gloss Polyester Label passed UL Certification for Child Safety Under 12 Years, and is RoHS and CONEG compliant. The clear acrylic adhesive has excellent resistant to chemicals and high temperatures, and can bond to high and low energy plastics and powder coat paints. It has a minimum application temperature of 50F and a service range of -40°F to 302°F. The 2 mil facestock is polyester that resists degradation from chemicals, scuffing, and wide temperature fluctuations. This label material prints very well in color and black and white laser printers. 102250 Outdoor/Indoor Polyester is a 2.3 mil white polyester label with a 1.1 mil acrylic permanent self adhesive. This material is UL approved under PGJI2 printing materials - Component and British Standard 5609. The Facestock is radiant white and resists degradation from scuffing, chemicals, and wide temperature fluctuations. The self adhesive bonds to high and low energy plastic surfaces, textured, and contoured surfaces, and is adaptable to many surfaces with a minimum application temperature of 50°F and a service range -40°F to 302°F. Rippedsheets.com is unique in that it offers a Clear Waterproof Vinyl Permanent Laser Label that prints well in color laser printers. The 102560 film is rated for two year with slight long term discoloration from UV light. Application temperature is 50°F and the service temperature after 24 hours is -40°F to +176°F. Sticks best to stainless steel, painted metals, acrylic and PET plastics, and glass. It is FDA approved for indirect contact with food. The 100850-20 wristbands has a non-Tyvek tear resistant that makes better print quality, stronger adhesive, and lower cost. Create unique ID wristbands or event wristbands on demand. Use software to serial number, sequentially number or barcode these laser waterproof wrist bands. Great for medical alerts and lost child information, this wristband is also used for crowd control, backstage passes, auditions, events, special privileges, catering, age ID, height restrictions, camps, schools, and much more! An excellent option for temporary date sticker for formula and milk, the apply-reapply 101850 leaves no residue! The print quality of this bright white matte paper label is excellent. Its "removable" and "repositionable" adhesive can be applied to smooth surfaces, removed and reapplied over and over again. Maximum adhesion is achieved in 24 hours. It offers excellent UV resistance, and complies with FDA 21 CFR 175.105 (Components of adhesives intended for use in packaging, transporting or holding food). This material is RoHS compliant and is compliant with the CONEG Model Toxics Packing Legislation. It is also archival safe and acid free. One of the exciting new enhancements available is the 303016 antimicrobial coating, which can be applied to any of these custom labels and tags. Testing was executed in accordance with JIS Z 2801 and found that it kills 99% of all bacteria. Rippedsheets.com offers high quality full color digital printing for ID labels and tags. Rippedsheets.com is able to offer full manufacturing work, including print, finishing, and direct-to-consumer shipping services for web dealers. Please visit the website or contact 1-888-791-9590 for more information.